Our AGM and Annual Event for Carers normally takes place in September and we are now inviting carers to book onto our 2018 Annual Event for Carers. 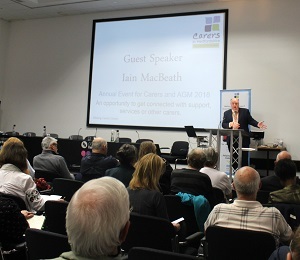 Almost 130 unpaid carers attended our 2018 Annual Event for Carers in Hatfield. They enjoyed time together away from caring and could find out about health, care and community services that can support them in their caring role. 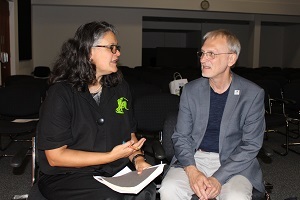 The theme of the 2018 event was connecting carers to services and support to help ease their caring role, it followed on from the focus of Carers Week in June 2018. Safeguarding – types of abuse and what happens when there is a safeguarding issue. Iain MacBeath, Hertfordshire County Council’s Director of Adult Care Services, spoke about the work being done to address the funding challenges for social care. He explained the various options that the Government will be consulting on in their upcoming Green Paper – including new insurance schemes and encouraging innovative new housing models. You can read our latest impact report in our pdf Impact Report 2017 to 2018 (6.50 MB) . Pictures from the 2018 AGM are below.